Thomas is living with his family in a poor part of London and though he tries to get along with his father, the two often clash. Thomas’s father wants his son to move out and begin a life of his own so when Thomas’s uncle arrives and offers to take Thomas to sea with him Thomas accepts happily. Thomas is especially excited about going with Uncle Rufus because he is one of the crew members on the ship of none other than the famous and much admired Captain Francis Drake. Imagine being able to see Captain Drake in the flesh, to work with him in fact. 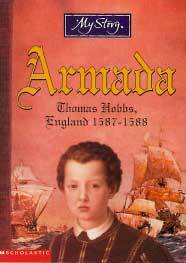 Thomas takes to life at sea as if he was born to it and though there are trials to be faced, he does well. He is there when Drake fires the King of Spain’s ships in the port of Cadiz and he is there again when England is faced with a possible Spanish invasion. The King of Spain soon rebuilt his fleet after the Cadiz incident and just a year later he sent his enormous Armada to England to remove Elizabeth I from the throne and to being England back into the Roman Catholic fold. Luckily for the Queen, she had Francis Drake on her side and with the help of bad weather, the English forces were able to defeat the Spanish once and for all.